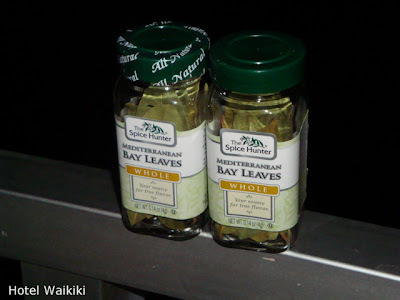 HOTEL WAIKIKI: Why do They Label Bay Leaves as "Whole" Leaves, When That's the Only Way They Sell Them? Because in the english-speaking world, they just love lots of words on their labeling. And that their mediterranean, why does that have to be there? You gonna expect me to believe that those whole leaves originated from my neck of the woods? I know one of my island aunties has a tree in her yard...I'll put in a good word for you. Rowena- I never know dat....that they had bay trees in the islands. "Mediterranean," is a town somewheres in the US. Yup, we have a huge Turkish bay leaf tree in our yard in Aiea. Bought it from Star Market about 15 years ago. Lisa- I can only imagine all the fragrance on a wet weather day.